Shop AmLactin Alpha-Hydroxy Therapy Rapid Relief Restoring Lotion + Ceramides Fragrance Free (7.9 oz. )7.9 oz. $1899$18 and 99 cents$2.40 / oz. 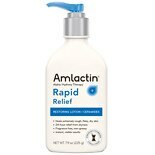 Shop AmLactin Moisturizing Body Lotion (14.1 oz. )14.1 oz. $2499$24 and 99 cents$1.77 / oz. 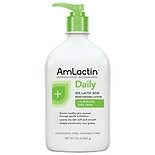 Shop AmLactin Moisturizing Body Lotion (8 oz. )8 oz. $1749$17 and 49 cents$2.21 / oz. Shop AmLactin Alpha-Hydroxy Therapy Ultra Smoothing Intensely Hydrating Cream (4.9 oz. )4.9 oz. $1749$17 and 49 cents$3.57 / oz.